Americans are generally oblivious to foreign exchange rate fluctuations. This is because the US dollar is one of the (used to the "the only") de facto international currencies. In countries where this his not the case, like Russia, foreign exchange rates are widely publicized to the public. After all, whether you are 5% richer or poorer on any given day compared to your neighbor in the adjacent country, while meaningless, does much for nationalistic feelings (and, if you are smart, for solid macroeconomic policy making). 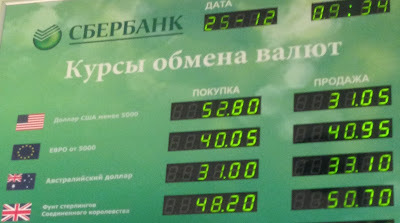 The first digitized column is the bank's buying rate; the second is the bank's offer rate. Notice that the offer rate is higher - as it should be - for the euro, Australian dollar, and British pound. However, not only it is lower for the US dollar, it is much lower. If these buy/sell rates were true, someone with a $100 could become a $11 billion+ man in just after 36 roundtrip trades. After all, he would be selling high and buying low. And, in the age of rapid on-line transactions, these trades would take less than 1 second. The moral of the story is that in Russia, as many government officials have clued in, it is possible to make big money fast with just a few trades and as many slights of hands. What is 50 Grams to You?